There are two types of retinoblastoma. Familial retinoblastoma is hereditary, is passed from parent to child, and is bilateral (affects both eyes). Familial retinoblastoma represents 10% of cases. It is associated with a long-term predisposition to other types of cancer. The second type of retinoblastoma, responsible for 70% of all new cases, is unilateral (only one eye is affected). It represents the non-heritable form of the disease, and carries no increased risk of a second tumor. Ninety percent of all retinoblastoma cases are diagnosed within the first three years of the child's life. On average, children with familial retinoblastoma typically are diagnosed at four months of age. When there is no family connection, the cancer is usually diagnosed when the child is approximately one to two years of age. The Red Reflex: checks for a normal red reflection in the eye that occurs when light travels inside the eye, hits the retina and the blood tissue, and is reflected back. The Corneal Light Reflex: when a light is shined into each cornea a symmetrical beam of light is reflected back in the same spot on each eye. This helps to determine whether the eyes are crossed. An Eye Examination: to check for any structural abnormalities. From six to twelve months of age, the eyes' ability to fix and follow objects both individually and together is evaluated. Between the ages of three and five, the examination of the eyes is coupled with testing for visual acuity, color vision and depth perception. Parents also may want to look for eye abnormalities by directly examining each of the child's eyes under good lighting conditions. Both eyes should appear equal in size, be aligned, and should be able to move together and focus forward. 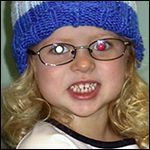 Parents can observe the red reflex can be seen by dimming the room lights and using a flashlight to shine light directly into the child's eyes. Persistent hyperplastic primary vitreous (PHPV): an unusual congenital anomaly whereby the eye is shorter than normal, develops a cataract, and may present with whitening of the pupil. Coat's disease: a typically unilateral disease, affecting young boys, leading to blood vessel abnormalities in the retina and retinal detachment. Toxocara canis: an infectious disease of the eye associated with exposure to infected puppies. This infection causes a retinal lesion leading to retinal detachment, which can mimic retinoblastoma. Retinopathy of prematurity (ROP): involves damage to the retinal tissue. It is associated with low birth weight infants who receive supplemental oxygen in the period immediately after birth. Often the first sign of retinoblastoma that is noticed is leukocoria, a whitening of the pupil that looks like a "cat's eye". This whiteness can be seen in certain lighting conditions. It is often noticed in photographs of the child taken with a flash, which usually causes the eyes to appear red in the picture. Instead of the normal red reflex, you may notice a white pupil in the photo, which comes from the white surface of the tumor itself. Roll your mouse over a photo to view a full-size image. It is extremely important that a child suspected of having retinoblastoma be evaluated by a team of specialists, including an ocular oncologist, a pediatric ophthalmologist, a radiation oncologist, and a pediatric oncologist within an ocular oncology center. Children with this rare cancer require the most advanced testing and management to ensure the cure of the cancer with preservation of the greatest amount of vision. Specialized testing is very important to confirm diagnosis, as there are no blood tests available to confirm a diagnosis of retinoblastoma. Unlike tumors in other parts of the body, a biopsy cannot be performed due to the risk of spreading cancer cells outside the eye. Before the initial eye examination, your child may need a MRI or CT of the brain and orbits (eye sockets), with and without contrast (dye). These tests help to confirm the diagnosis of retinoblastoma and look for involvement of retinoblastoma with the optic nerve and any cancer outside of the eye. Before the ophthalmologist examines your child, an optometrist or ophthalmic technician may take a medical and family history. Your child will receive eye drops that will dilate the pupils of the eye, which allows the ophthalmologist to examine the interior of the eye. The ophthalmologist will discuss his initial findings and possible treatment options. Hemoglobin: the substance in the red blood cells that carries oxygen and is responsible for the blood's red color. Lower hemoglobin amounts than indicate anemia. Hematocrit: a measure of the amount of red blood cells, expressed as a percentage of the whole blood that is made up of red cells. A low count may indicate anemia. Platelets: the component of the blood that helps stop bleeding in case of injury. White Blood Cell Count (WBC): the components of blood that fight infection. Children receiving chemotherapy generally have a lower white cell count than normal. Evaluation and treatment of children with retinoblastoma involves a variety of diagnostic testing. Many of these tests are performed when your child is first diagnosed and are repeated at intervals over the course of treatment to monitor progress and response to therapy. Both a CT scan and a MRI require sedation to help a child lie quietly. There usually are no side effects from either of these tests, but children may be drowsy from the sedation. The difference between a normal eye and an eye containing retinoblastoma is very obvious, as you will see when the doctor shows you the x-rays. The CT scan or MRI usually shows the tumor(s) within the eye, since calcium accumulates in retinoblastoma tumors and is visible on the scan. Computerized Tomography (CT): A CT scan of the head is a computerized X-ray that provides a very clear picture of the eyes, the surrounding tissue and the brain. During the scan, the child's head is placed on a special headrest to allow proper positioning and to minimize movement during the scanning procedure. Unlike an ordinary X-ray machine, which takes one picture at a time, the CT scanner takes a number of small pictures as it rotates around the patient. This procedure takes about one hour. Magnetic Resonance Imaging (MRI): Magnetic Resonance Imaging uses magnetic fields and radio waves linked to a computer to create pictures of areas inside the body. The child lies on a table that slides into a tunnel-shaped piece of equipment. Antennas within the MRI machine pick up the radio waves within and feed them into a computer that assembles a picture. Because MRI can "see" through bone, it can provide clearer pictures of tumor located near bone and in the orbit. This procedure also takes about one hour. During an ultrasound examination sound waves are directed towards the tumor by a small probe placed on the eye. Because tumors generate different "echoes" than normal tissue, sound waves above the range of human hearing can be bounced off tissue and then changed electronically into images. The pattern made by reflection of the sound waves helps to confirm that tumors are present and assists the doctor in establishing what type of tumor is present. Ultrasound also helps to determine the thickness or height of the tumor. A bone marrow test or lumbar puncture may be performed as part of a child's initial EUA to make sure the cancer has not spread to the child's bones or brain. Both the bone marrow test and the lumbar puncture are completed in approximately 15 minutes. Usually there is only temporary tenderness at the site. Bone marrow is the substance inside the larger bones of the body where healthy new blood cells are made. A small amount of the bone marrow is removed from the hip through a small needle and examined in the laboratory for cancerous cells. Since retinoblastoma can also spread into the brain, tumor cells may be floating in the cerebral spinal fluid (CSF) that bathes the brain and the spinal column (inside the backbone). To obtain the CSF, a small amount of fluid is drawn through a narrow needle at the base of the spine. The CSF is then tested for cancerous cells.